In honor of me turning 30, I made mix CDs of my favorite songs from each of my 30 favorite musical artists/groups. Read the introductory post for more background information on my 30 at 30 project. Reminder: there is no scientific rationale for this list. They’re simply my personal favorites. Coming in at number 1 is Counting Crows. 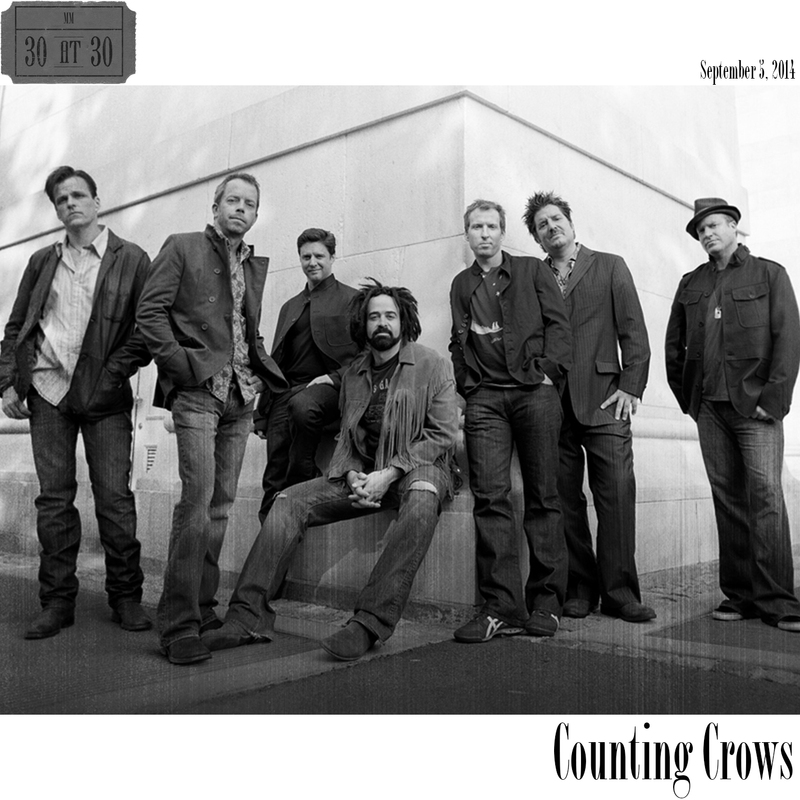 Counting Crows had a profound influence on me as an adolescent and young adult. Although I first heard Counting Crows on the radio in the early 90s when I was a preteen, I rediscovered the band and their music during my senior year of high school. 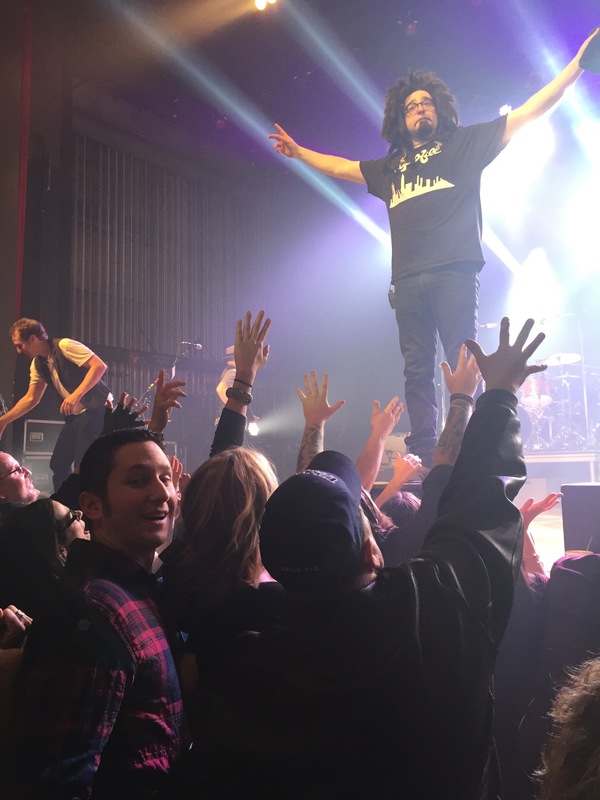 The number one reason I connected with Counting Crows was the lyrics of lead singer Adam Duritz. Despite being 20 years my elder, Duritz’s lyrical poetry resonated with me on a deep, spiritual level. The combination of his artfully crafted words and his passionate, vulnerable vocal performances made me relate to Duritz as a soul brother. Counting Crows released their fourth studio album, Hard Candy, on July 8, 2002, midway through the summer before my senior year of high school. I probably listened to that album 100 times that summer while also immersing myself in the previous Counting Crows releases. I attempted to compile a “Best of” Counting Crows CD and ended up making a three-disc set that nearly included every song from their catalog. Every time I listened through an album it seemed like a different line from a different song caught my attention and fit my mood. 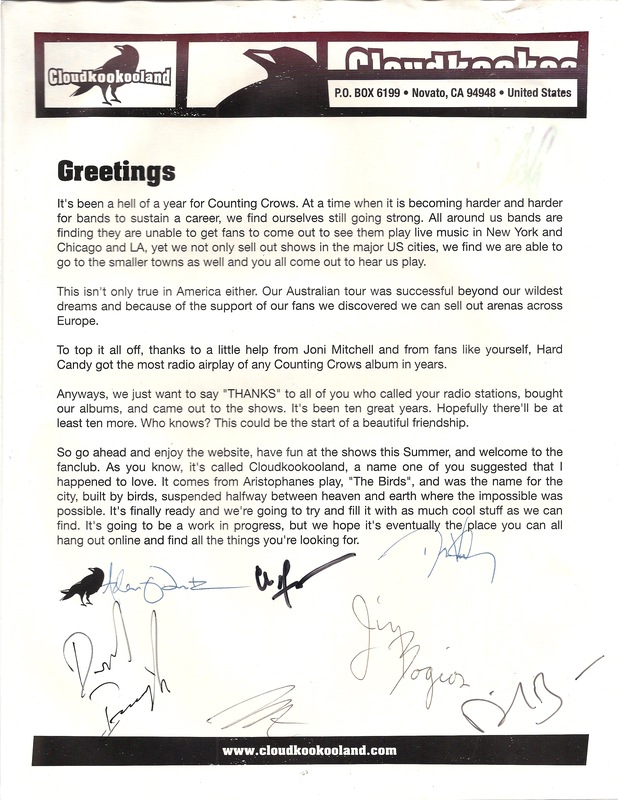 The welcome letter I received upon joining Cloudkookooland, the official fan club of Counting Crows. By the time the spring of 2003 rolled around, I was an unabashed Counting Crows fanatic. I joined the band’s official fan club at the time, Cloudkookooland. As the letter reads, the name “comes from Aristophanes’ play, ‘The Birds’, and was the name for the city, built by birds, suspended halfway between heaven and earth where the impossible was possible.” I also spent evenings reading and posting on Counting Crows message boards, which is how I discovered the burgeoning subculture of online bootleg music trading. 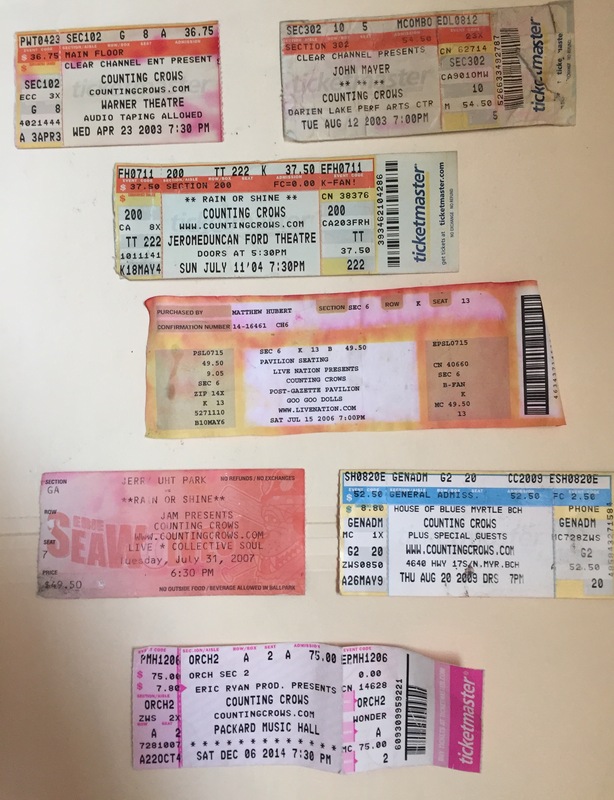 Although the Internet connection speed of the early 2000s made it difficult, I slowly built a sizable collection of Counting Crows concert bootleg recordings, which the band did not discourage so long as they were not being sold by anyone for profit. Unfortunately, I lost most of those recordings in an apartment fire in 2009. However, the time I spent listening to recorded versions of live Counting Crows performances opened my ears to a whole new world of Counting Crows music that I never had experienced before. Two things stuck out from the live shows: Adam’s innate ability as a storyteller on stage and first-rate musicianship of the individual band members, especially Charlie (Gillingham), Dave (Bryson), Dan (Vickrey), and Immy (David Immerglück). What I didn’t know was that listening to all of those live recordings was priming me for one of my the most meaningful experiences of my life. As fate would have it, Counting Crows’ spring tour brought them to the Warner Theatre in Erie, Pennsylvania, on April 23, 2003. It was my favorite band in my hometown less than two months before graduating from high school. Oh yeah, and it was also the first concert I ever attended. My buddy Ryan Colvin and I had great seats up front on the left side near the stage, and we were treated to an unforgettable performance. Fortunately for me, the show was recorded and I was able to obtain a copy through the online Counting Crows community that I was a part of. That live recording remains a treasured piece of my collection to this day, and that concert cemented Counting Crows’ legacy in my own mind as my all-time favorite band. After coming home from the concert I was insatiable. No amount of Counting Crows seemed to be enough. Impulsively, I decided then and there to redecorate my bedroom wall, which had previously been adorned exclusively with sports posters. I cleared the area of the wall above my bed. Centered above the bed was a poster of the band I had purchased at the concert. Meticulously, I surrounded the poster with printed copies of the lyrics from every song as well as the album artwork from each of the band’s four studio albums on coordinated colored paper. Obsessed? Perhaps. Dedicated? Undoubtably. I was no longer just a member of the fan club Cloudkookooland, I was living in it. 7. December 6, 2014, at the Packard Music Hall in Warren, OH. In all, I have seen Counting Crows live in concert on seven occasions. I’ve seen them in five different states. I’ve seen them perform at inside at concert halls and outside in a baseball stadium. I’ve seen them perform in spring, summer, and winter. To me, asking me to compare shows is like comparing children. They are all special and unique, and I wouldn’t trade away the experience of attending any of them. There’s us and there’s the stage. 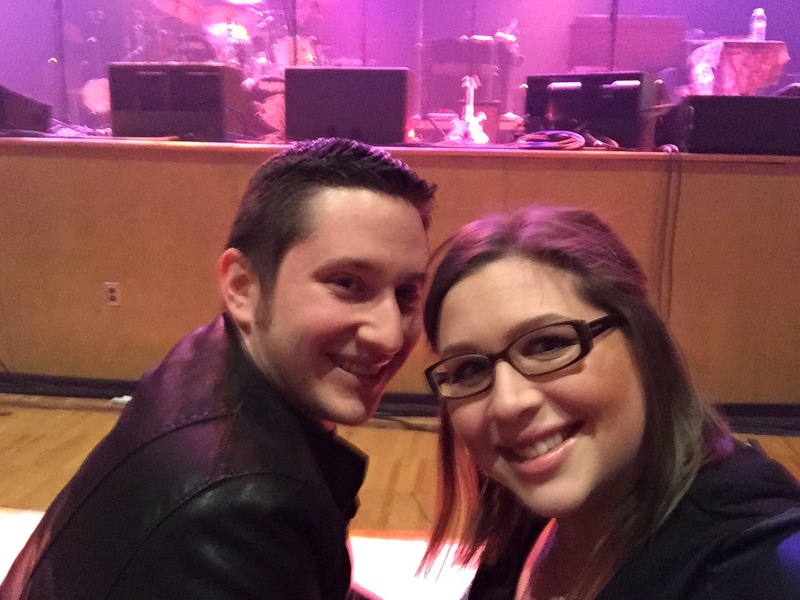 Posing for a photo with Adam at the close of the Counting Crows show in Warren, Ohio, in December of 2014. Having said that, my most recent Counting Crows live experience understandably stands out freshest in my mind. It was the first time seeing the band live since I got married in 2011 and the first time Jessie and I had seen them together since all the way back in 2006, so I knew it was going to be a memorable event. The icing on the cake was that we had front row seats! Plus, the band had just released its latest album Somewhere Under Wonderland in September, five days before my 30th birthday. Hearing many tracks from that album live for the first time that night was among the many highlights, including a rocking rendition of “Miami” and the seasonally appropriate “A Long December“. I wholeheartedly disagree with one of the regular criticisms of Counting Crows concerts. If your goal for a concert is for the band to play a carbon copy of the album you listened to on the way to the concert, Counting Crows is probably not the band for you. Adam is bound to change the words, wander in and out of songs with storytelling snippets, slightly alter a melody here or there, or add in an alternate verse to your favorite song. They might play that fast song you like slow or turn that acoustic ballad you love into an electric rocker. Sure, singing along at a Counting Crows concert often becomes difficult because Adam zigs when you expect him to zag, but while Duritz may pump fake the audience better than Michael Jordan with his lyrical alterations, the rest of the band remains in sync with their lead singer, and there is never a question of whether the band is feeling it or not. These guys were born to rock. With Adam as the eccentric, sometimes brooding leader, the band puts on a show night after night, year after year. It’s clear that they’re having the time of their lives, improvising riffs and solos, playing off one another, and creating something special in the moment for that particular audience on that specific night. I’ve been privileged to be part of that audience seven times, and hopefully number eight isn’t too far off in the future. Not surprisingly, I own more Counting Crows music than I own from any other band or musician. In fact, I have so many Counting Crows songs that iTunes measures the collection in days rather than hours and minutes. It’s not only the quantity though; it’s the quality of my Counting Crows song collection that made this such a maddening process. 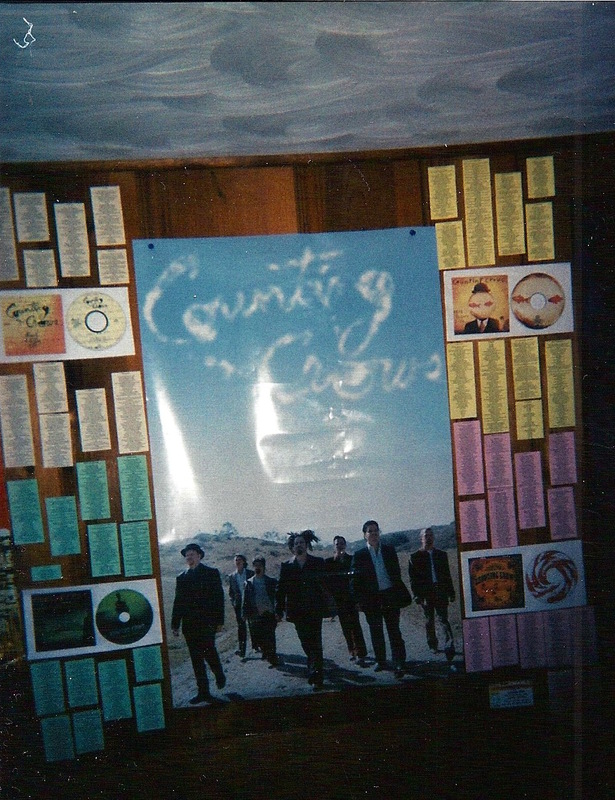 None of the 30 at 30 project tracklists were easy to compile, but Counting Crows was unquestionably the most difficult. Over the years, Counting Crows have landed 64 unique tracks on Matt’s Mixes (John Mayer’s 44 unique tracks comes in a distant second place). Trying to narrow that number down was going to be challenging enough. Add in the length of some of my favorite Counting Crows tracks, and it meant I had to cut the CC compilation all the way down to 12 songs, the fewest number of tracks of the entire 30 at 30 project. With apologies to the many amazing songs that did not make the cut, the final 12 represent (in my mind) the best of Counting Crows. And in a nod to how great the band is live, nearly half of the tracks on the final compilation are live performances. Track one is only my favorite song ever. It’s a 15-minute live version of “Round Here” (from 1993’s August and Everything After) played live in Boston, Massachusetts, on Halloween in 1999, I wrote about it in my favorite songs post earlier this summer. Track two is the aforementioned “Mr. Jones” also from AAEA. I don’t care that it’s become the cliché Counting Crows track. It’s a good song, a fun singalong, and always a crowd pleaser. Speaking of crowd pleasers, track three, “Hanginaround” (from 1999’s This Desert Life) often shows up in the encore of Counting Crows concerts because it’s such a high energy, crowd-participation-friendly, stomp-and-clap-along song. Track four, “Rain King” (another AAEA track) is one of the band’s most versatile concert songs. They can play it up-tempo electric or slowed down acoustic. The album version that I chose to include is more of the former and fits in well following on the heels of “Mr. Jones” and “Hanginaround.” Lyrically, “It’s a song about everything the goes into writing, all the feelings, everything that makes you want to write and pick up a guitar and express yourself. It’s full of all the doubts and the fears about how I felt about my life at the time,” as Adam explained during a VH1 Storytellers special. I knew “A Murder of One” was going to make it onto this compilation, but there were a few different live versions of the song (yet another AAEA song) competing for this track five slot. Eventually, I settled on the New York City performance from July 27, 1994. The alternate lyrics and the musical breakdown and crescendo leading to the final repeated line of “Please come home!” is really powerful. Track six, “Sullivan Street,” is the fifth and final AAEA track to make the compilation. Again I opted for a live version. This version is from the August and Everything After: Live at Town Hall concert CD that was recorded in 2007 and released in 2011. It features the “Does she wanna run away from me?” alternate lyrics that are often added into live performances of the song. Track seven, “Chelsea,” is a hidden track from the 1998 two-disc set Across a Wire: Live in New York City. It is arguably the band’s most beautiful (albeit sad) sounding song, but maybe that’s my trumpet bias speaking. If there is one complaint I have for Counting Crows it’s their lack of a regular trumpet player in the band, which prevents them from playing a song like “Chelsea” or the intro from “Palisades Park” live in concert. he don’t know what to do. He just wants to look good for you. but he can’t think of what to say. I think you’ll listen anyway. You watch him as he stutters over what to say. It’s just a little game you play. Track nine is “Goodnight Elisabeth” as played live in Erie during my first Counting Crows concert on April 23, 2003. Originally from the band’s sophomore album, 1996’s Recovering the Satellites, this live version of “Goodnight Elisabeth” includes the “it’s alright” alternate lyrics. Track ten, “Up All Night (Frankie Miller Goes to Hollywood)” is the second track from Hard Candy to appear on the compilation. This is one of my favorite Counting Crows songs to belt out while driving in the car. When I was younger, especially in my late teens and early 20s, I liked to stay up late online, often chatting for hours with friends and love interests until 2 or 3 a.m. After I finally went to bed, I often found my mind still very much awake and struggled to get to sleep, so I related to this song. Track eleven is “A Long December” from Recovering the Satellites. The song includes one of my favorite Counting Crows lyrics: “A long December and there’s reason to believe / maybe this year will be better than the last.” I feel like that is such a relatable sentiment. People feel this sense of hope and optimism as they turn the calendar from December to January and begin a new year.